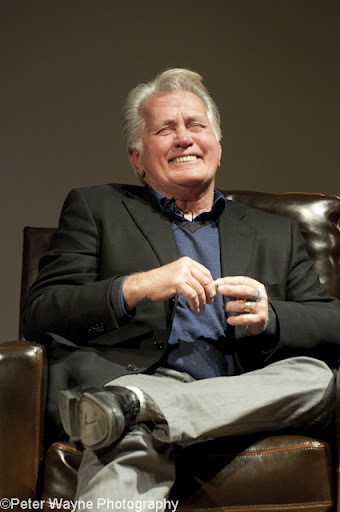 The adoration of Martin Sheen wasobvious from the minute he set foot on the stage at the Boulder Theater Saturday afternoon. The entire sold-out premises rose as one to welcome him and theirenthusiastic and joyful applause visibly moved the actor, who asked “Why aren’tyou all outdoors in the sun doing something athletic?” He said he couldunderstand a massive crowd like this if there was a foot of snow outside andthe temperature was below freezing. 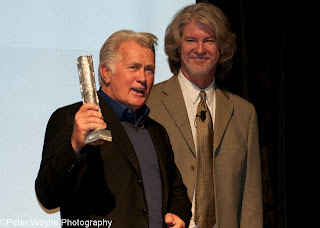 He accepted his Master of Cinema Award graciously, but called it the "You’re not Dead Yet" award . . . andsaid he was off to Irelandnext week to get another. He spoke of "The Way," an independentfeature which he starred in and which was written and directed by his son Emilio, who wasalso in the film. They used all their own money tofund the film he said, their time was very limited, they were shooting in aforeign country and stress was high. (They had run out of money and son Charliecame to the rescue.) But by the end of the filming he had come to look uponEmilio as his hero. As an alcoholic himself (who hasn’thad a drink since l989) he commiserated with Charlie who he said is athoughtful, caring person who has his problems. Now a very handsome and healthy-looking 71, he has received over 70 major awards and honors and been arrested67 times due to his non-violent but anti-government behavior as an activist. He spoke lovingly of his mother andfather, both immigrants (Irish and Hispanic, respectively) who met atimmigration in New York City. He was not anxious to speak ofFrancis Ford Coppola or of his experience during the making of "Apocalypse Now" (being drunk andlater having a heart attack on screen, both incidents kept in the film by thedirector). He said it was not an instant hitbut when Vietnamveterans started going to see it and said it was totally true to life, itbegan to be popular. Mr. Sheen was so ebullient that hecontinued talking long after his time was really up and the Q & A from theaudience continued until it was time for the next event at the theater. And so he finally departed, leavingeveryone in attendance with the feeling that they had just had a wonderful andvery personal conversation with an old friend.